A building with added value. 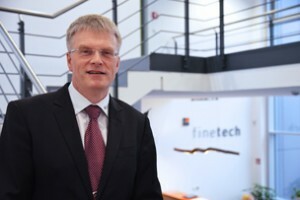 The new Finetech building provides optimal support for the work processes in research and development as well as prototype construction and production. 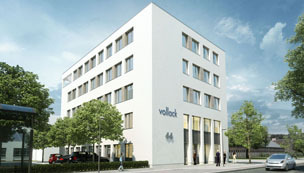 The premises comprise a two-story production and office building with a floor space of around 1,800 square meters and a separate production hall with a floor space of 3,200 square meters. The strictest standards for precision and cleanliness are ensured for the highly sensitive products as well as for work with customer applications. Cleanrooms with the ISO 9-6 standard and a virtually dust-free atmosphere were created for this purpose. Another highlight is the energy storage system underneath the building, which has an air flow and utilizes the energy potential of the soil. The gravel storage system adjusts the incoming air to the right temperature beforehand, allowing the company to cut energy costs significantly – in winter as well as in summer.